Happy Friday readers! As some of you may know, Ash and I went to grad school in Vermont. (We got our Master’s in Historic Preservation there, in addition to our undergraduate degrees in preservation from a school in Rhode Island) To celebrate Ash’s upcoming birthday (it’s a big one), we decided to go back to Vermont for a little trip and revisit some of the places that we used to love in Vermont. With that in mind, and due to the fact that I will not be around next Friday to post, today’s fantasy is a Vermont treasure: the Justin Smith Morrill Homestead (Vermont’s first National Historic Landmark). 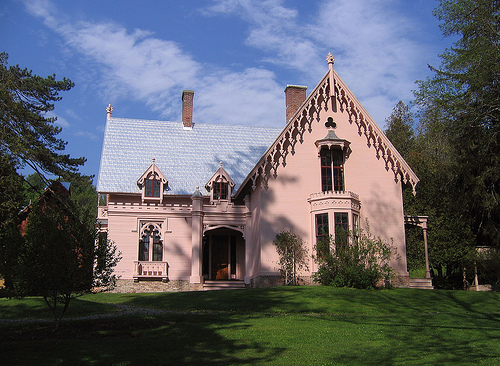 The Morrill Homestead in Strafford, Vermont is a Downingesque Cottage with Carpenter Gothic trim (see this post on Downing for a refresher). Justin Smith Morrill was born and raised in Strafford, where he attended school until the age of 15 (so around 1870). After that time, he was removed from school to help his family earn a living. Morrill wanted to attend college but didn’t have the means, so he taught himself in fields that interested him, including architecture. It was this love of learning that led him to become a senator and sponsor the 1862 and 1890 Land Grant Acts that established Land Grant colleges for students who wouldn’t otherwise have the means to go. The Morrill homestead just went through a big restoration. If you are in Vermont anytime you should check it out! I just wanted to quickly share this link to a recent National Trust Blog Post on saving the Historic Rehabilitation Tax Credit, something that is essential to our Countries historic building stock and economy. Spread the word and contact your legislators to save the Tax Credit! 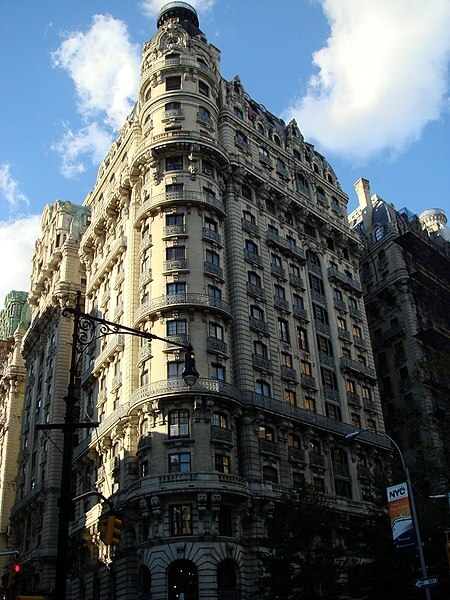 The Hayden Building is a rare surviving H.H. 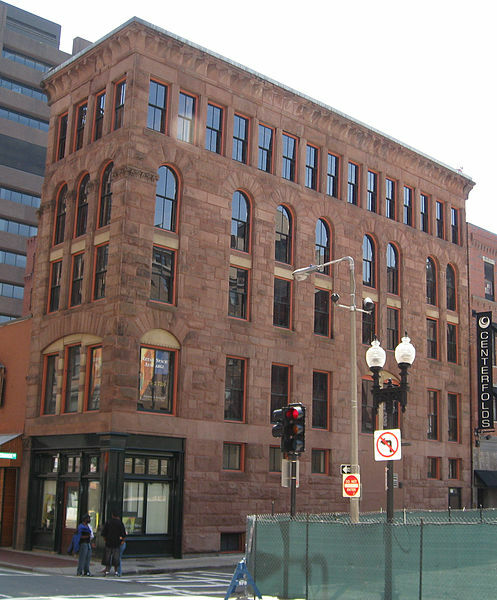 Richardson commercial building that is being saved and converted in to mixed-use space thanks to state and federal Historic Rehabilitation Tax Credits. Happy Friday readers. We have reached the end of summer and Labor Day is only days away. One of the things that Labor reminds me of is the American Dream…. you know, the neat house with a spacious lawn and white picket fence, 2.5 children and a freshly waxed family sedan gleaming in the driveway (or at least that’s what we are told the American Dream is). 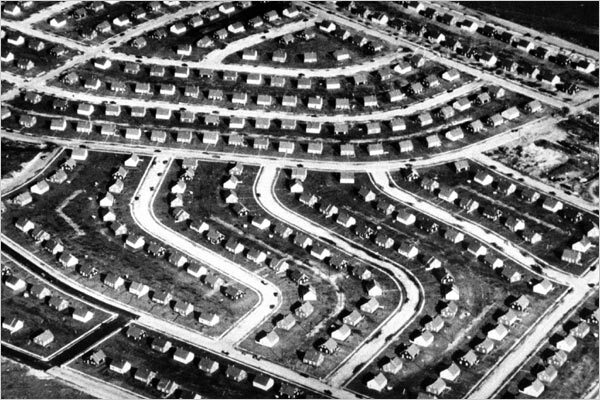 To me, nothing reminds me of this more than Post World War II suburbs, and of course, the grand-daddy of them all is Levittown. That is today’s Fantasy, and while it is nowhere near as grand as our usual Fantasies it is probably the most achievable, which was, after all, the point of Levittown! 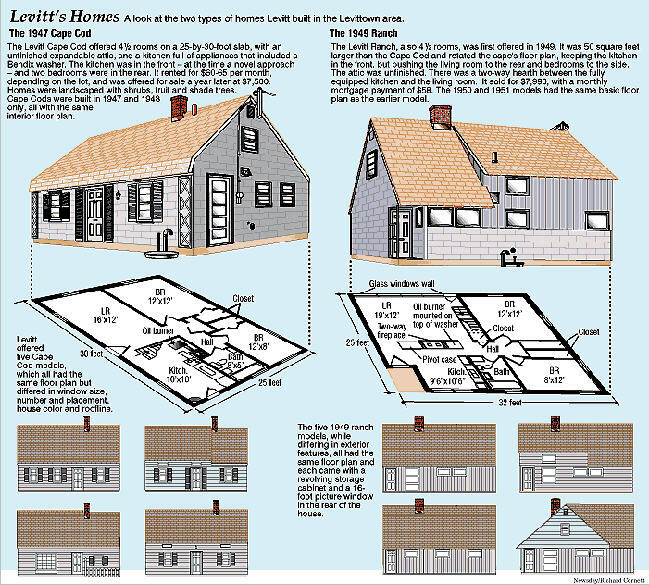 Levittown (the original Long Island one, as there are OTHER Levittowns in Pennsylvania and in other places) is a Post WWII suburb developed for returning GI’s by Real Estate Lawyer Abraham Levitt. He had the idea to turn 60,000 acres of flat grassland on Long Island (which he bought when the original developer defaulted on a loan in the 30s) into a planned community of 2,000 rental houses. He made this announcement in the paper in 1947 and 2 DAYS later half of the houses were already spoken for. Obviously the demand was great and Levitt and his sons (who helped their Dad with this venture) realized they needed to find a way to speed-up this process and make it cost-effective, so they removed basements from the plans for their houses, taking a cue from houses built on slabs in the south. This was actually against building code at the time, but with the baby-boom just beginning, nobody argued. 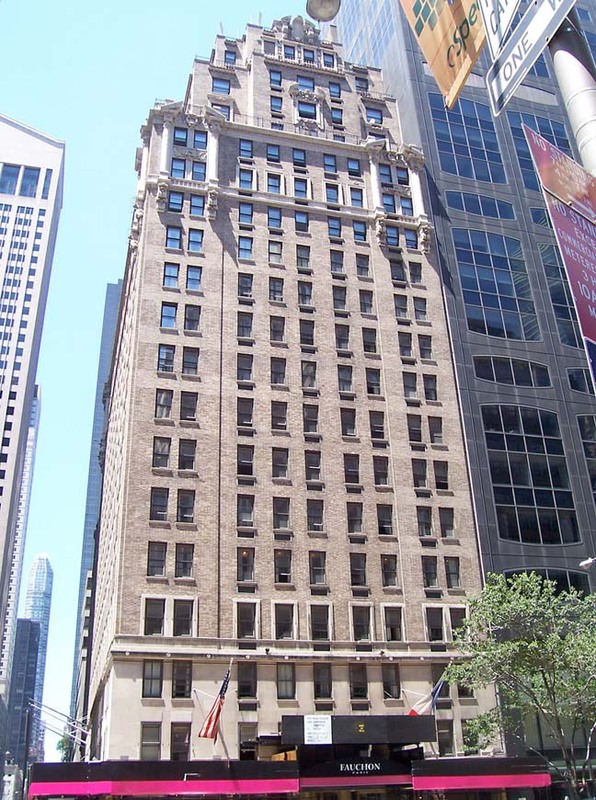 In fact, the State of New York changed the building code to make concrete slab foundations allowable, because the need for housing was so great! The Levitt’s used pre-cut lumber and produced their own nails at a nail factory they owned. Using these precursors to prefabricated materials, the company was soon able to raise around 30 houses a day! The incredible thing is that even 30 houses a day was not enough to keep up with the demand for housing. Those original 2,000 houses were joined by another 4,000 houses, a school (and later additional schools) and post-office to accommodate the burgeoning town. 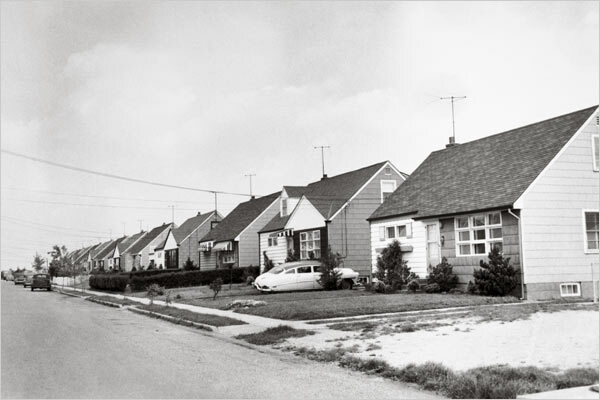 Levittown Houses. New York Times. 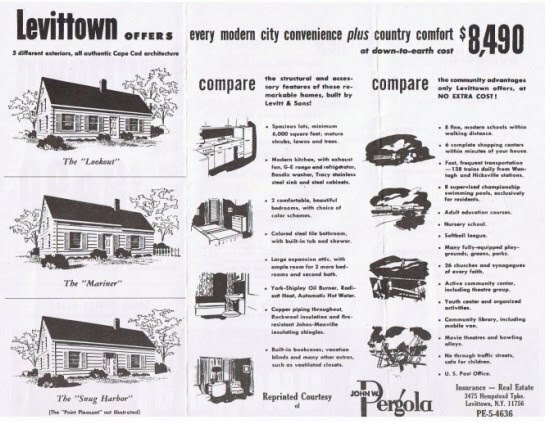 In 1949, the Levitts went from building rental houses to building Ranches for SALE, and they continued this until the last one sold in 1951. Levittown became such a part of American life that spawned American culture including Rock-star Billy Joel, who grew-up in a Levitt House (and was friends with Ash’s Mom when they were young… so ya’know, that’s AWESOME). There is TONS of information on the different Levittowns out there, but one of the bests I think is the one-and-only Levittown Historical Society which many of my dates came from. I also came across this neat blog about life in Early Levittown. Hope you enjoyed this look at American Developments and the 1950s American Dream! Enjoy those end of summer BBQ’s and have a great Labor Day! Hey readers! As summer starts to wind down, Ash and I finally have some time to breathe, so I thought that I would share an amazing piece of architecture from Ash’s home State of New Hampshire with you. We have spent a lot of this summer traveling around our beloved New England and if you take a trip to New England any time soon, today’s Fantasy is one you shouldn’t miss! 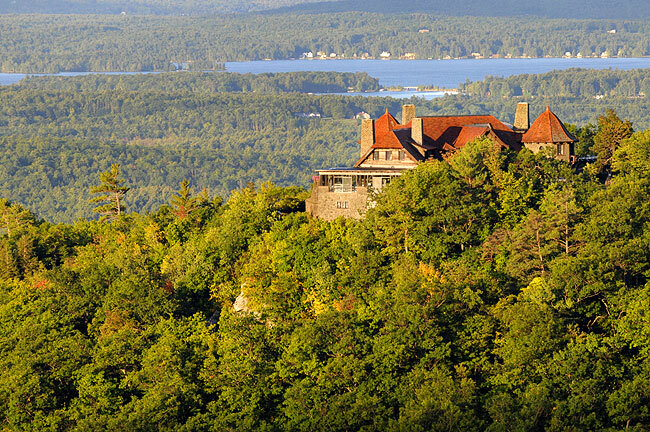 Today’s Fantasy is Castle in the Clouds in Moultonborough, New Hampshire. When it was built in 1913-1914, the manse was originally named Lucknow, but people have been calling it Castle in the Clouds since it opened to the public in 1959. Castle in the Clouds is a great example of the Arts and Crafts style, which is all about craftsmanship and a departure from the gaudily ornate Victorian architecture that dominated the last quarter of the 19th century (for more on this read the post on the Gamble House). Castle in the Clouds (Lucknow) was built for Thomas and Olive Plant, who were newly married. Thomas Plant made a fortune from the sale of his shoe manufacturing company to the United Shoe Manufacturing Company and retired to plan a country estate. 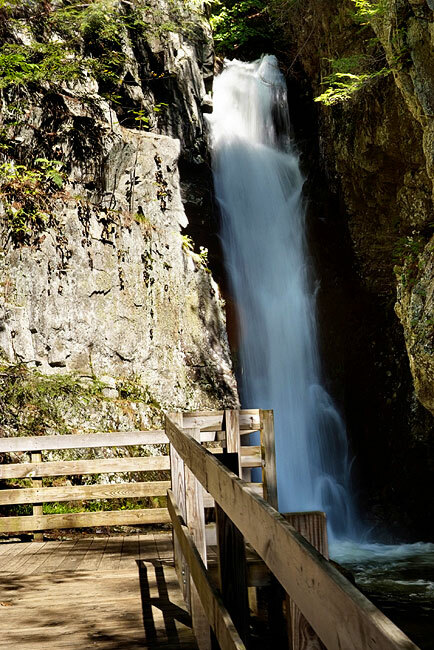 To accomplish this, he bought over 6,000 acres spanning from the Ossipee Mountains to Lake Winnipesaukee, including the land known as the Ossipee Mountain Park . 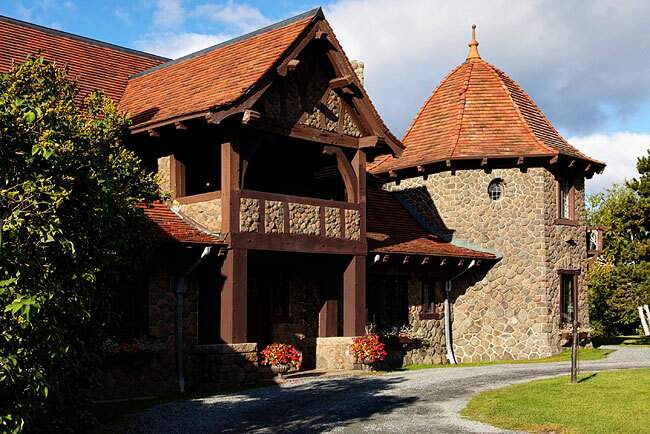 One of the amazing things about Castle in the Clouds is that Mr. Plant not only had this house built, but he also built a pretty extensive network of roads around the estate that allowed the Plants and visitors to enjoy the natural beauty that surrounded them; including a series of waterfalls that feed into near-by Shannon Pond. In the 1930s, the Great Depression hit the Plants, who tried to cut their losses by selling Castle in the Clouds. Despite their financial duress, they still wanted to be good stewards of the estate they created, so when no buyer was found, they continued to live there until 1941 when Mr. Plant died. Only then was Castle in the Clouds sold. Since then, it has undergone relatively few changes and today it is run by the Castle Preservation Society, a non-profit organization dedicated to maintaining this treasure! 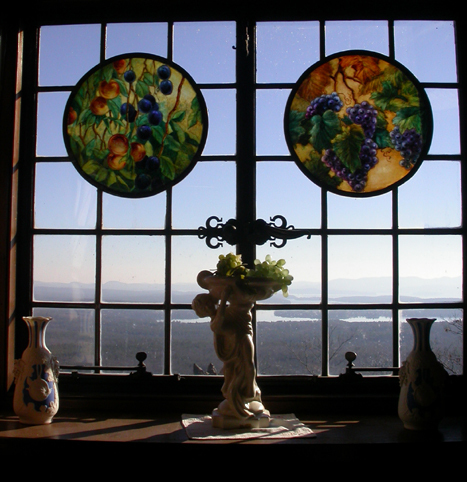 They have a website, with great pictures and a virtual tour in case you can’t make it to New Hampshire anytime soon (the photos below are from the Castle in the Clouds website). I think this shot best illustrates why it is called Castle in the Clouds…. but now I’ll have Les Miserables stuck in my head ALL day…..
An up close view that really emphasizes Arts and Crafts principles. Can you beat this view? Or the Art Glass panels, for that matter? One of the many natural features that Plant planned the property around. Well, that’s it for today. Hope you enjoyed your quick trip to Ash’s home state. P.S. A special thanks to my friend Peter who recently had a work project here and reminded me of how great Castle in the Clouds is. I think it made a great Fantasy. Happy Friday Readers. Sorry for the extended absence but I’m back now. I was gone for so long because I attended a National Park Service Training event in Baltimore (and then had to catch-up at work). I had a great time and got a lot of valuable information, so I wanted to share some of what I saw and learned in Baltimore with you. So, in honor of my recent trip, today’s Fantasy isn’t a house, but a National Treasure, which, in fact, noted Architectural Historian Vincent Scully is said to have called “the most perfect church in North America.” Today, I give you the Baltimore Basilica, America’s first Cathedral. Built in 1806-1821, the Basilica was designed by Benjamin Latrobe. Latrobe is often called the Father of American Architecture, or America’s first Architect. (Also known for the Bank of Pennsylvania, and The Latrobe gate at the Navy Yard) In addition to Latrobe’s remarkable design work, the construction project was overseen by Bishop Carroll, head of the Archdiocese of Baltimore, who wanted a Neoclassical church (a style he considered to be “American”) to reflect the Neoclassical capitol of this budding nation at Washington, DC. 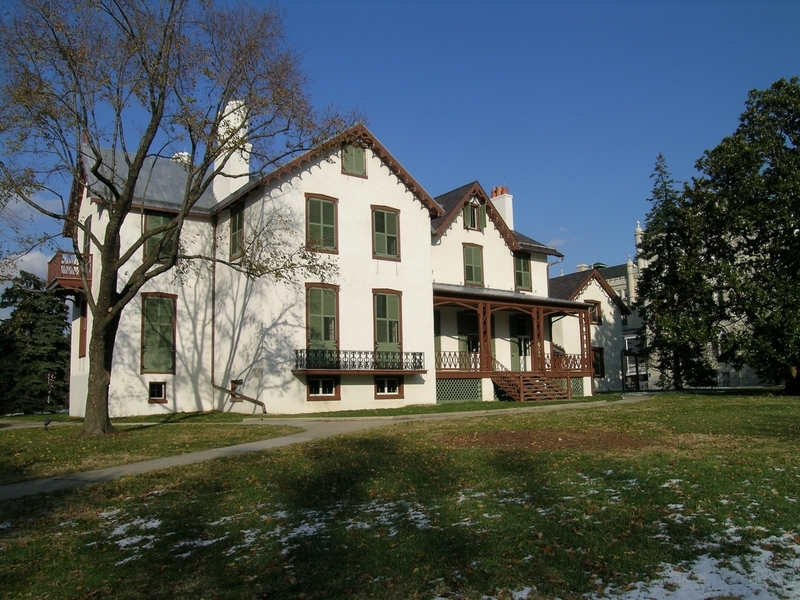 Latrobe was the perfect choice for this project, as he was an admirer of Thomas Jefferson’s architectural views, a fact that is evidenced in his book, Thomas Jefferson: Architect of the Capitol. Jeffersonian Neoclassicism is clearly reflected in the Basilica, specifically the skylights in the dome ( a design element that Jefferson insisted on for the Capitol Building). 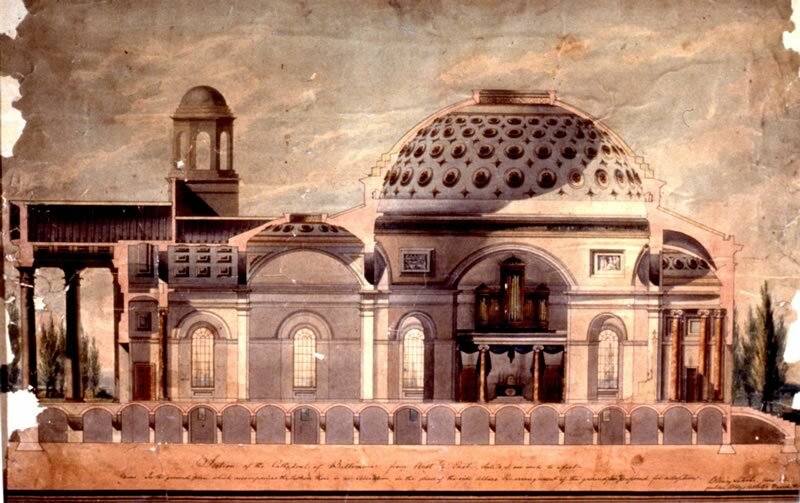 Carroll’s initial idea and Latrobe’s design eventually went on to become America’s First Cathedral, and later, a National Historic Landmark. 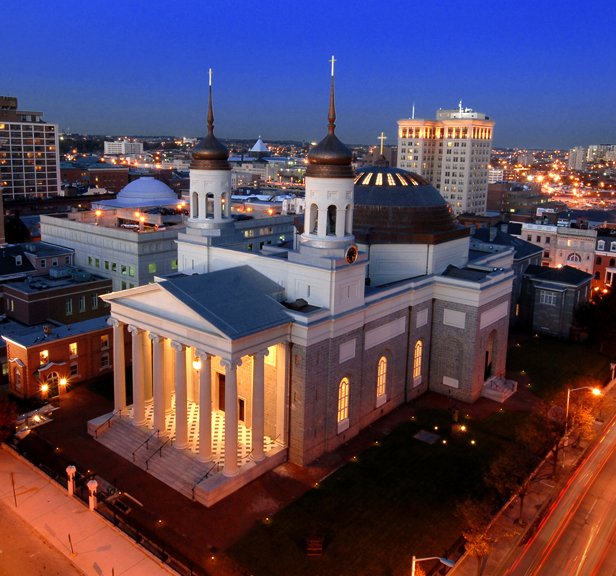 The Basilica underwent restoration in 2004-2006, in anticipation of the church’s bicentennial celebration. 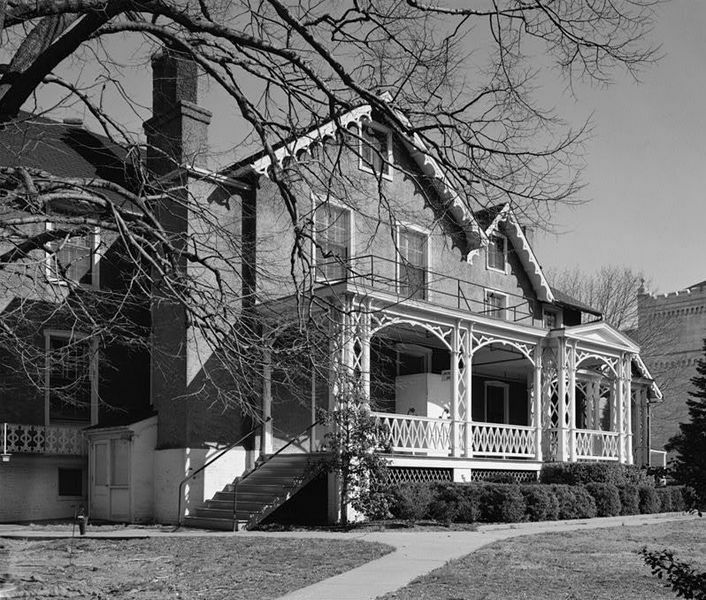 The restoration work proposed what was called a “return to Latrobe’s vision,” which is somewhat controversial amongst Preservationists, as the Secretary of the Interior’s Standards for Rehabilitation state that, “Each property shall be recognized as a physical record of its time, place, and use. Changes that create a false sense of historical development, such as adding conjectural features or architectural elements from other buildings shall not be undertaken,” and ” Most properties change overtime; those changes that have acquired historic significance in their own right shall be retained and preserved.” However, since Preservation is a pretty fluid discipline and involves a lot of theory, there are also those who believe that the the Restoration was a success… Still, whatever your stance, no one can deny the fact that the Basilica is a beautiful building and an important part of American Architectural History. Hope you enjoyed the Baltimore Basilica. I will be adding more photos a bit later when I get them off my camera. Check back in for the update soon. TGIF Readers! I feel like this is Friday #2 this week, with the holiday on Wednesday. Speaking of the 4th of July, since I am still coming down from my post-fireworks euphoria, I have decided to theme today’s Fantasy in honor of our recently passed holiday. As you may know (or may not, as I do have some foreign readers), Independence Day (often better-known as the 4th of July, for the date the holiday falls on) is an American Holiday in which the citizenry celebrates the signing of the Declaration of Independence, by which the Founding Fathers of our nation stated that America was its own country and should be free of British rule. This act of treason led to war between Britain and the American colonies, which eventually led to the creation of the country we know today… and it all began on July 4, 1776 (granted, that’s the thumbnail sketch of the founding of the United States, as there were many acts of rebellion that led up to the signing of the Declaration of Independence and the Revolutionary War, not to mention some confusion among when the Declaration was actually signed, but to avoid writing a book that’s been written several times over, I’ll leave us with the understanding that the holiday is on July 4th and we’re celebrating America). Today, the 4th of July represents patriotism and love of country, both of which I can wholeheartedly support. In honor of those sentiments, today’s Fantasy is tied to one of America’s most beloved Presidents: Abraham Lincoln. Abraham Lincoln was America’s 16th President, responsible for leading the Union through the Civil War, writing the Gettysburg Address and the Emancipation Proclamation, and he was also assassinated. What many people don’t know about President Lincoln is that, although he loved the White House, he actually dearly loved another house in Washington, DC, more. This other house was a seasonal retreat for Presidents. 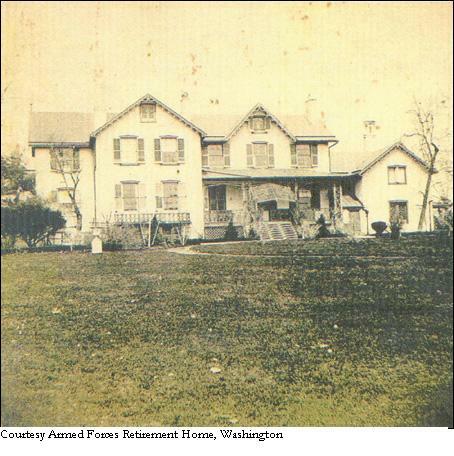 It was (and still is) a cottage on the grounds of what was known as the Soldiers Home (Now known as the armed forces retirement home). 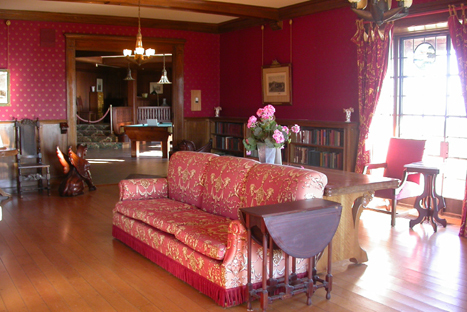 Hope you enjoyed this look at President Lincoln’s Cottage. If you are in Washington, D.C., you should check it out. If you won’t be in the D.C. area anytime soon, you can visit the Cottage Website here.